It is not to serve as much an application that you report the percentage of false accounts that follow you on Twitter, but at least one can know the approximate number of ghosts followers that have the same or any other Twitter account. 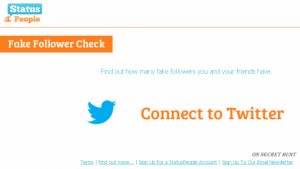 To use Fakers just enter the site, authorize the application to access your Twitter account and then you will get a screen in which enter the Twitter account you want to check. As a result delivery the percentages of 3 groups of accounts: False Accounts, Inactive Accounts and Real accounts. According to Status People, the creators of this tool, to perform calculations take a sample of 500 records and confront such data against a set of criteria for simple spam. They also explain that spam accounts tend to have few followers and little or no tweets or none, but in return tend to follow a lot of accounts. These are not perfect. To get a result closer to reality should conduct a much deeper study, account by account. But maybe we can used it to compare accounts.